The GRTC Transit System’s long-term partnership with Genfare has resulted in many unique solutions for Richmond’s public transit system over the years. Most recently, the two organizations collaborated to refresh the system’s entire fare payment program, installing Fast Fare fareboxes, integrating them with GRTC’s Mobile Pass mobile ticketing, and investigating a variety of solutions to enhance the passenger experience in the future. But when it came time to develop a mobile fare payment solution for GRTC’s new BRT, The Pulse, the collaboration had to rise to a whole new level. The paper ticket vending machines on each of The Pulse’s 14 stations were designed to be an easy-to-use, traditional solution for those who prefer to purchase a paper ticket, however, GRTC’s tech-savvy passenger base also desired a mobile app payment solution. So, how do you roll out a mobile fare payment system when you have no fareboxes or bar code scanners on the vehicles? And, how do you build in fraud protections that will eliminate fare evasion? 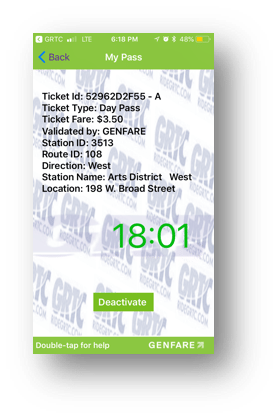 The solution that GRTC and Genfare developed relies on the scanning of a QR code that is specific to each Pulse station and is prominently displayed on the station’s signage, and Mobile Pass was modified to include a Pulse-specific module. When the user chooses to use one of their mobile passes (which are currently the 1-, 7-, and 30-day unlimited use mobile passes) to ride The Pulse, the user selects the Pulse pass option when they activate the pass so they can interact with the QR reader at the station using their mobile device’s built-in camera. Once the user scans the QR code, the pass is activated and they receive a screen like the one shown here that displays where they boarded the Pulse. The displayed clock will start at 45 minutes and begin to count down and move around the screen, which the users leave running in the background while riding the Pulse as a proof of payment. 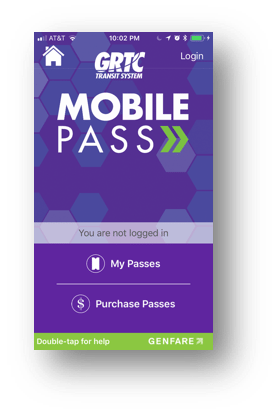 The animated screen protects against fraud that could result from users who might try to deceive fare inspectors by using screen captures of activated passes. Once Mobile Pass users complete their rides on The Pulse, they can click the “Deactivate” button, and they will be done until ready to ride The Pulse again. The Pulse launched its initial service in June 2018 and ridership has exceeded expectations. According to GRTC, there are already more than 30,000 Pulse riders per week. On an average weekday, The Pulse now carries more than 6,000 riders, far exceeding and almost doubling the goal of 3,500 daily riders.